Watermill Theatre bring to Cardiff off-Broadway hit Murder for Two, an unusual musical comedy slash murder mystery acted out by two men and a piano. 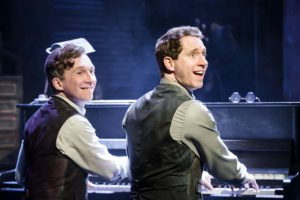 Such an intriguing premise carries with it a number of daunting technicalities, not last the fact that both actors on stage have to play their characters while playing the piano for a sizable chunk of the time. High-energy performance are required to keep the very fast pace of the play up for its entire duration, and such performances were undoubtedly delivered by both Ed MacArthur, as Detective Marcus, and Jeremy Legat, on whose shoulders rested the far-from-easy task of playing all the suspects. It must also be noted that all character changes involved minimal wardrobe design – all were done through change of hats and physical posture. That Legat managed to pull this off almost without glitches and still leaving all characters immediately recognisable, even in the quicker exchanges, is in itself a touch of bravura that is to be applauded. That said, the play required some adjustment to its unusual storytelling before it seemed to properly take off, and it is only halfway through the first act that the narration becomes really engrossing and the style of the narration can be effortlessly followed. After a first segment that was at risk of coming across as somewhat contrived, perhaps also because the pace was at first slightly too fast, the plot starts unfolding more regularly and it becomes a pleasure to follow the antics of the varied set of characters brought to the stage (down to a surprising plot twist in the ending that is admittedly quite hard to see coming). The way in which characters are invoked is at times extremely ingenious – a little sketch with an umbrella and two hats, for instance, makes for a heated three-way conversation that feels more convincing than it would sound on paper. Even though they don’t always all work to perfection, the creativity in coming up for various solutions to handle the plot with such a small cast is certainly remarkable. Murder for Two is without doubt a comedy, and its sense of humour is manifold, drawing from a variety of styles and suggestion. It certainly has some physical comedy and some clever wordplay, but there is more than a hint of the tradition of cabaret in the way that songs are used as a vehicle for cutting, tongue-in-cheek humour accompanied by piano solo. The conflation of cabaret, storytelling, music and straight-out acting is probably the greatest strength of this production and makes for its most delightful moments. It also helps that most of the musical numbers are witty, played to catchy tunes, and performed artfully; the song closing off the first half in particular (So What If I Did) was both perfectly tuned in its dark humour and performed in a way that best highlighted the strength of the lyrics. There were a number of moments in which the fourth wall was broken, but not so that it became obnoxious (nor that it spoiled a fundamental plot point that in a sense relies on playing with the fourth wall). Most of the play comes across as genuinely funny, the twists in the plot still come unexpected in spite of all, and the work certainly has the ability to engage and amuse its audience. All in all, while Murder for Two is not perfect, takes some acclimatisation at the start and has some occasional glitches in pacing, it is still an entertaining night and, most importantly, a piece that does not rely on surefire comedic routines but puts great effort into being genuinely original and experimenting with riskier avenues. Theatre in general, and comedy in particular, is in need of works willing to attempt different strategies, and Murder for Two is for the greatest part successful in its own attempt. It has some memorable tunes and some moments of high comedy, and its convincing moments outnumber its shortcomings.